Frigid belays, stormy summit pushes, whiteout descents: When you need dependable high-loft insulation, nothing else will do. 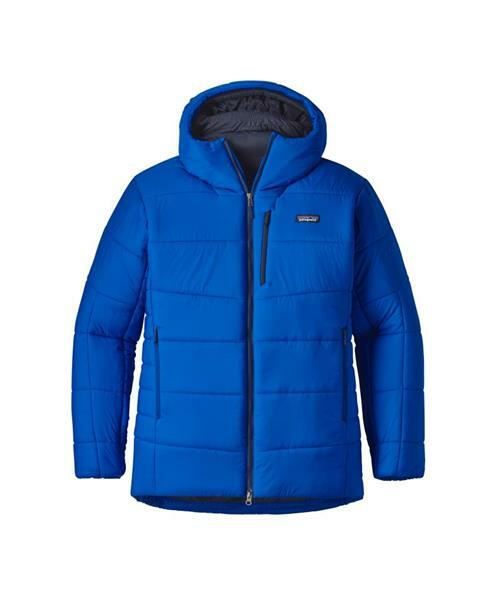 The new Hyper Puff™ Parka features Patagonia's innovative HyperDAS™ insulation (100-g polyester, 200-g in the front and back torso), their warmest synthetic, which packs down small but springs back to far greater loft than other synthetic insulations of its weight. A lightweight ripstop nylon Pertex Quantum® shell, with polyurethane coating, surrounds the insulation and is durable, water-resistant, windproof and treated with a DWR (durable water repellent) finish. The parka stretches to accommodate your moves and to help trap your heat, along with articulated patterning and internal elastic stitching on the sides to hug your body and eliminate drafts. A simple, articulated, helmet-compatible hood has internal elastic stitching, a minimal visor and a single-pull drawcord adjustment. The 2-way zipper lets you see your belay device, and elasticized cuffs along with a discreet drawcord at the drop hem further seal in warmth. Pockets: two zippered, insulated handwarmers; large right-interior mesh drop-in; large left-interior zippered drop-in; one exterior zippered chest. Comes with stuffsack for easy storage.